hola, guapa. : fall 2013 cutest couple contest. fall 2013 cutest couple contest. 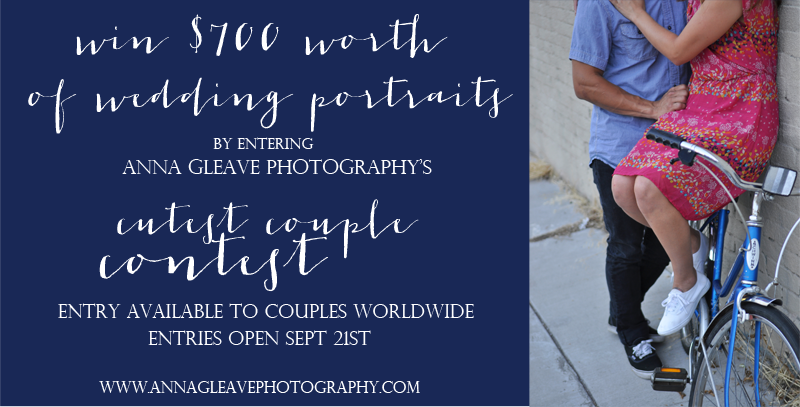 i'm so excited to announce october's official relaunch contest: $700 worth of wedding portraits to one lucky + adorable couple out there! so here's how the contest works: you send in a photo of you and your love, you tell us a bit about your love, you show the world how much you're in love, and you win free wedding photos! easy enough, right? the best part?! you don't have to be located in utah or colorado or even the united states, for that matter, to enter the contest! let me break it down a bit more clearly for you. the contest opens for entries on september 21, 2013, and entries close on october 1st. there will be two rounds to the contest, with the official winner announced on october 22nd. the photos and a short description of the couple will be placed on facebook. couples will receive one point for every "like" that their photo receives. for a "like" to count, the individual liking the photo must also "like" anna gleave photography on facebook. couples can receive additional points during this round for receiving comments in their favor on the official blog post or facebook image (only one comment per individual counts), getting others to "share" images from anna gleave photography on facebook, pinterest, and twitter. more detailed instructions in regards to this will be given to the couple upon entry. the top three couples will be tallied up on october 13th, and they will be interviewed more extensively for a feature on anna gleave photography's blog. they can also send in an additional photo or get creative with video, etc. to show their love. as in stage one of the contest, couples will receive points for their "likes" and comments. other social media shares will also be added to their score. and by october 22nd, the polls will be in, and we'll have ourselves a winner and a runner up! both couples will receive prizes, and all couples who enter will receive 15% off their wedding packages with anna gleave photography. first place: $700 in wedding portrait credit that can be applied to a wedding day or used for a full (1+ hour) engagement and full (1+ hour groomal session). please note that all sessions come with edited digital images. second place: a free one-hour engagement session with 25 edited digital images and 20% off a wedding package. and because i think you're all so cute! : all couples who enter will receive 15% off a wedding package booked with anna gleave photography. 1. couples must be in love (but unwed). 2. couples must love images full of heart and soul and want some of these images to call their own! 5. anna gleave photography must be available on couples' preferred session//wedding dates, and dates may not conflict with her already booked dates. 6. portrait credit//discounts must be used by the applying couple and are non-transferrable. 7. all credit and discounts associated with this contest must be used by may 15, 2014. 8. submitted images may not be watermarked or used to represent any other photographer. e-mail me with the following! please note that this giveaway/contest is not affiliated with any social media outlet (facebook, twitter, pinterest, etc.) or organization other than anna gleave photography.